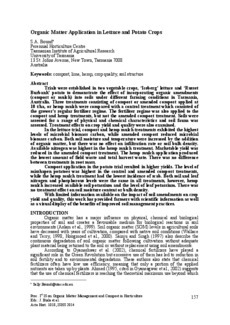 Trials were established in two vegetable crops, ‘Iceberg’ lettuce and ‘Russet Burbank’ potato to demonstrate the effect of incorporating organic amendments (compost or mulch) into soils under different farming conditions in Tasmania, Australia. Three treatments consisting of compost or amended compost applied at 10 t/ha, or hemp mulch were compared with a control treatment which consisted of the grower’s regular fertiliser regime. The fertiliser regime was also applied to the compost and hemp treatments, but not the amended compost treatment. Soils were assessed for a range of physical and chemical characteristics and soil fauna was assessed. Treatment effects on crop yield and quality were also examined. In the lettuce trial, compost and hemp mulch treatments exhibited the highest levels of microbial biomass carbon, while amended compost reduced microbial biomass carbon. Both soil moisture and temperature were increased by the addition of organic matter, but there was no effect on infiltration rate or soil bulk density. Available nitrogen was highest in the hemp mulch treatment. Marketable yield was reduced in the amended compost treatment. The hemp mulch application produced the lowest amount of field waste and total harvest waste. There was no difference between treatments in root mass. Compost application in the potato trial resulted in higher yields. The level of misshapen potatoes was highest in the control and amended compost treatments, while the hemp mulch treatment had the lowest incidence of scab. Both soil and leaf nitrogen and phosphorous levels were the same in all treatments, however, hemp mulch increased available soil potassium and the level of leaf potassium. There was no treatment effect on soil moisture content or bulk density. With limited information available on the impact of soil amendments on crop yield and quality, this work has provided farmers with scientific information as well as a visual display of the benefits of improved soil management practices.